Kirstjen Nielsen said Russian interference in the 2016 U.S. elections was "directed from the highest levels." One of President Donald Trump's top cabinet officials told a gathering of cybersecurity leaders on Tuesday that the Russians attacked the 2016 presidential election and that "America will not tolerate this meddling." "Two years ago, a foreign power launched a brazen, multi-faceted influence campaign ... to distort our presidential election," said Department of Homeland Security Secretary Kirstjen Nielsen during an opening roundtable at the DHS National Cybersecurity Summit in New York. "Let me be clear: Our intelligence community had it right. It was the Russians." "We know that, they know that. It was directed from the highest levels. And we cannot and will not allow it to happen again." Nielsen's unequivocal rhetoric, and her willingness to point fingers at the upper echelons of Vladimir Putin's government, were a sharp contrast with Trump's shifting position on whether the Russians interfered in the 2016 U.S. election and his skepticism about the assessments of the U.S. intelligence community. During his summit with Putin in Helsinki, Trump said he didn't see why Russia would've interfered in the election. The next day, July 17, Trump said he meant to say the opposite — "I don’t see any reason why it wouldn't be [Russia]" and that he accepted the intelligence community's "conclusion" that Russia had meddled. But he also added: "It could be other people. A lot of people out there." 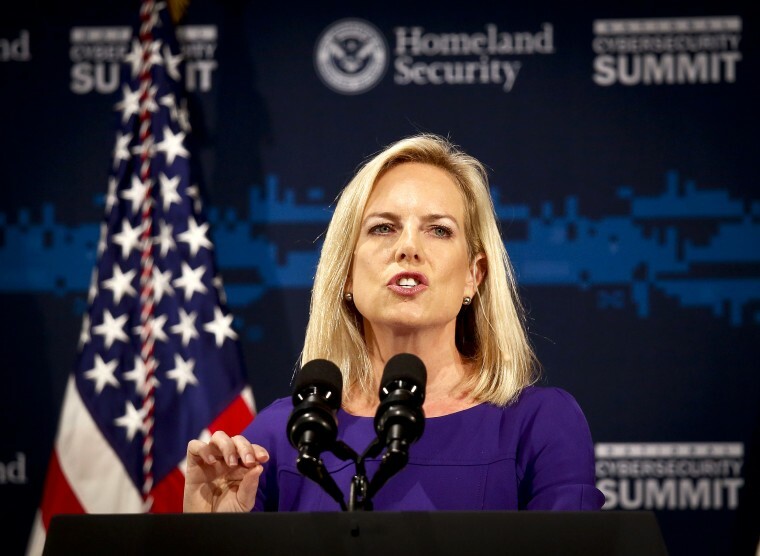 At the Cybersecurity Summit, Nielsen said "our democracy itself is in the crosshairs" and under attack, but that she was confident the U.S. will succeed in repelling the attacks. "Although no actual votes were changed in 2016," said Nielsen, "Any attempt to interfere in our elections is a direct attack on our democracy, it is unacceptable, and it will not be tolerated." "Mark my words: America will not tolerate this meddling. ... A Category 5 hurricane has been forecast. And now we must prepare." Nielsen also announced the creation of the DHS National Risk Management Center. The center's goals, according to a statement from DHS, are to "identify, assess and prioritize efforts to reduce risks to national critical functions which enable national and economic anxiety." Nielsen's comments in New York Tuesday echo her assertion at the Aspen Security Forum two weeks ago that Russia had interfered in 2016 with U.S. election systems and it would be "foolish" to think they had stopped. She would not say whether she believed Russian meddling had favored Trump.